For a topical guide to this subject, see Historical outline of Arizona. The history of Arizona encompasses Spanish, Mexican, and American periods. Arizona was part of the state of Sonora, Mexico from 1822, but the settled population was small. 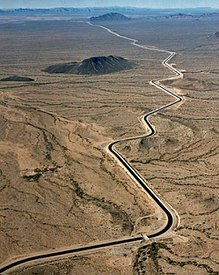 In 1848, under the terms of the Mexican Cession the United States took possession of Arizona above the Gila River after the Mexican War, which became part of the Territory of New Mexico. By means of the Gadsden Purchase, the United States secured the northern part of the state of Sonora, what is now Arizona south of the Gila River in 1854. Arizona was a part of northern Mexico in the 1840s. It was remote and poor and seldom had outside contacts. 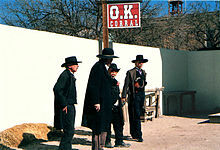 The Mexican population, based in Tucson, was a few hundred, in addition to a presidio garrison of about 100 soldiers. The mission was deactivated in 1828. South of the Gila River it was mostly in the province of Sonora, and a fragment of Chihuahua in the east. To the north Arizona was nominally part of Alta California and a fragment of Santa Fe de Nuevo México in the east. Together with help from Pima and Papago militia, the garrison provided a little protection from a hostile Apache population to the east of the San Pedro River and north of the Gila. In the Mexican–American War, the garrison commander avoided conflict with Lieutenant Colonel Cooke and the Mormon Battalion, withdrawing from the town while the Americans marched through the town on their way to California. In the Treaty of Guadalupe Hidalgo (1848), Mexico ceded to the U.S. the northern 70% of modern-day Arizona above the Sonora border along the Gila River. During the California Gold Rush upwards of 50,000 men traveled through on the Southern Emigrant Trail pioneered by Cooke, to reach the gold fields in 1849. The Pima Villages often sold fresh food and provided relief to distressed travelers among this throng and to others in subsequent years. The history of Arizona as recorded by Europeans began in 1539 with the first documented exploration of the area by Marcos de Niza, early work expanded the following year when Francisco Vásquez de Coronado entered the area as well. Arizona was part of the state of Sonora, Mexico from 1822, but the settled population was small. Starting in 1853, the entirety of present-day Arizona was part of the New Mexico Territory. In 1849, the California Gold Rush led as many as 50,000 miners to travel across the region, leading to a boom in Arizona's population. In 1850, Arizona and New Mexico formed the New Mexico Territory. In 1853, President Franklin Pierce sent James Gadsden to Mexico City to negotiate with Santa Anna, and the United States bought the remaining southern strip area of Arizona and New Mexico in the Gadsden Purchase. On February 23rd 1883 United Verde Copper Company was incorporated under New York law. The small mining camp next to the mine was given a proper name, 'Jerome.' The town was named after the family which had invested a large amount of capitol. In 1885 Lewis Williams opened a copper smelter in Bisbee and the copper boom began, as the nation turned to copper wires for electricity. The arrival of railroads in the 1880s made mining even more profitable, and national corporations bought control of the mines and invested in new equipment. Mining operations flourished in numerous boom towns, such as Bisbee,Jerome, Douglas, Ajo and Miami. 1903 editorial cartoon by Bob Satterfield, depicting Arizona and New Mexico as crazed gunfighters intent on gaining access to the " E pluribus unum tavern". A new constitution was offered with the problematic provisions removed. Congress then voted to approve statehood, and President Taft signed the statehood bill on February 14, 1912. State residents promptly put the provisions back in. Hispanics had little voice or power. Only one of the 53 delegates at the constitutional convention was Hispanic, and he refused to sign. In 1912 women gained suffrage in the state, eight years before the country as a whole. ^ Larry D. Christiansen, "The Extinction of Wild Cattle in Southern Arizona," Journal of Arizona History (1988) 29#1 pp 89–100. ^ Arroyo Rodriguez, Nadine (2014-09-26). "Did You Know: Capital Of Arizona Moved 4 Times Before Settling In Phoenix". kjzz. Retrieved January 9, 2019. ^ a b Byrd H. Granger (1960). Arizona Place Names. University of Arizona Press. p. 10. Retrieved 20 November 2011. ^ James A. Wilson, "West Texas Influence on the Early Cattle Industry of Arizona," Southwestern Historical Quarterly (1967) 71#1 PP 26–36. ^ For colorful details see Jana Bommersbach, "Jana's View: (Un)Clean Sweep," Phoenix Magazine June 2009 Archived 2014-01-07 at the Wayback Machine; Acme is now the ghost town of Goldroad. ^ Atchison, Topeka; Santa Fe Railway Company (1906). The Grand Canyon of Arizona: Being a Book of Words from Many Pens, about the Grand Canyon of the Colorado River in Arizona. Santa Fe Railroad. p. 121. ^ William D. Kalt (2006). Tucson Was a Railroad Town: The Days of Steam in the Big Burg on the Main Line. VTD Rail Pub. ^ Patrick Graham, "Urban Development Putting the Squeeze on Arizona Citrus Industry Agriculture: As groves are swallowed up by sprawl, the importance of grapefruits, oranges, lemons and tangerines to the state's economy is shrinking steadily", Associated Press, June 27, 1999. ^ Thomas E. Sheridan (1995). Arizona: A History. U. of Arizona Press. p. 326. ^ Michael F. Logan (2006). Desert Cities: The Environmental History of Phoenix and Tucson. U. of Pittsburgh Press. p. 148. ^ Jacqueline Vaughn (2007). Conflicts Over Natural Resources: A Reference Handbook. ABC-CLIO. p. 132. ^ Donald W. Carson; James W. Johnson (2004). Mo: The Life and Times of Morris K. Udall. University of Arizona Press. ^ Joan Biskupic (2006). Sandra Day O'Connor: How the First Woman on the Supreme Court Became Its Most Influential Justice. Harper Collins. ^ Sheridan (1995). Arizona: A History. p. 349. ^ a b Archibold, Randal C. (April 24, 2010). "U.S.'s Toughest Immigration Law Is Signed in Arizona". The New York Times. p. 1. ^ "19 firefighters working Yarnell Hill Fire confirmed dead". FOX 10. June 30, 2013. Archived from the original on July 1, 2013. Retrieved June 30, 2013. ^ a b Staff writers (June 30, 2013). "Yarnell Hill Fire: Wildfire grows to more than 2,000 acres, 19 firefighters killed". ABC15. Retrieved July 1, 2013. ^ Federal Writers' Project (1956). "Chronology". Arizona, the Grand Canyon State. American Guide Series (4th ed.). New York: Hastings House. Sheridan, Thomas E. (1995). Arizona: A History. U. of Arizona Press. Wagoner, Jay J. Arizona Territory 1863–1912: A Political history (U. of Arizona Press, 1970). Haskett, Bert. "History of the Sheep Industry in Arizona," Arizona Historical Review (July 1936) 7#1 pp 3–49. Logan, Michael F. (2006). Desert Cities: The Environmental History of Phoenix and Tucson. U. of Pittsburgh Press. Smith, Karen Lynn. The Magnificent Experiment: Building the Salt River Reclamation Project, 1890-1917 (U. of Arizona Press, 1986). Walker, Henry Pickering; Bufkin, Don (1986). Historical Atlas of Arizona (2nd ed.). Norman: University of Oklahoma Press. Berman, David R. George Hunt: Arizona's Crusading Seven-Term Governor (University of Arizona Press, 2015) 251 pp. Fong, Lawrence Michael. "Sojourners and Settlers: The Chinese Experience in Arizona," Journal of Arizona History (Autumn 1980) 21#1 pp 1–30. De Long; Sidney Randolph (1905). The history of Arizona: from the earliest times known to the people of Europe to 1903. Whitaker & Ray. Hinton, Richard Josiah (1878). The Hand-book to Arizona: its resources, history, towns, mines, ruins and scenery ... Payot, Upham & Co.
Our history before that is unknown.